A life in boats shaping and crafting their construction from timber, a life on the water working with the waves, currents and wind – this was Carl Halvorsen’s remarkable century that came to a peaceful close just over a week ago. From birth he was instilled with a passion for the sea from his maternal ancestors who had been captains, seafaring from their Norwegian homeland, while boatbuilding was a trade and skill passed from his father. Carl and the Halvorsen family continued this trade not just because it was the tradition, but because this was where they were comfortable and capable – working with boats and the sea. The Halvorsen story is well known and recorded, and the Australian Register of Historic Vessels (administered by the museum) captures their beginnings in Norway and their passage to Cape Town and then later to Sydney in the 1920s, and follows the rise of the family business to its eventual pre-eminence in Australian boatbuilding. The register hosts pages about their individual vessels, from the well-known luxury cruisers, through to the hire boats and wartime craft. Their yachts are represented as well, including Maud, built in Sydney in 1927 and raced by Harold and Carl to success at the Sydney Amateur Sailing Club. Maud might be seen to represent a time when the feeling of freedom Carl experienced as a child playing on the waterfront in Helle, Norway, had finally returned. His youth and early adult years felt the experience of post-war depression and upheaval as the family moved twice into the unknown. It was a time when everyone needed to work hard to secure a living for the family, and when responsibility was thrust early onto Carl’s young shoulders as one of the older family members. By the late 1920s the firm of Halvorsens was established and there was time to enjoy the success, and Maud brought them back to the simple joys of owning and racing a yacht. In one way or another that feeling remained with Carl throughout the rest of his life, and in his work with the family business he crewed on some of the delivery voyages with the mission boats, and enjoyed test-driving many of the motor vessels, especially during the war. 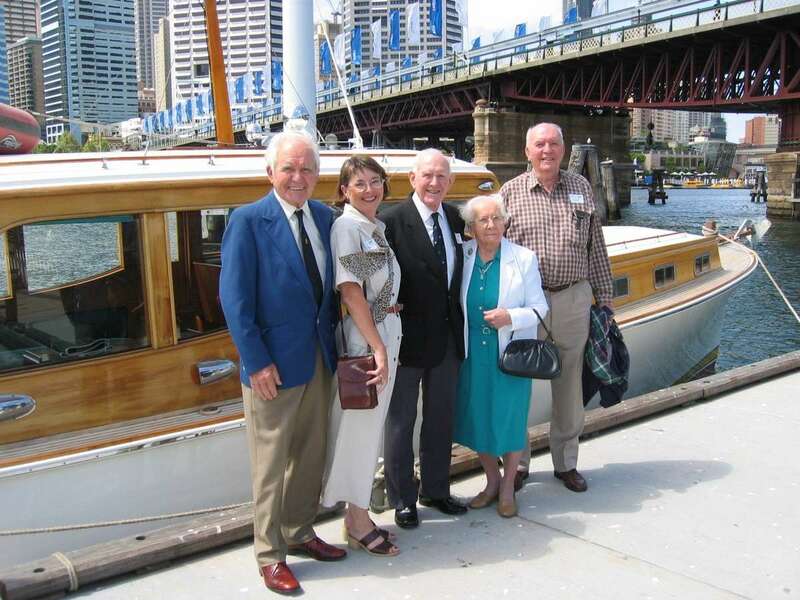 When the firm had a brief foray into the American market, one of Carl’s experiences as marketing manager was to go across on the ship with Tooronga and showcase its launch on the west coast where it was eventually sold, as were a couple of other cruisers. Treasures from that period are photos of the time spent with Bob Hope, Alfred Hitchcock, John Mills, Ernest Borgnine and other famous names of the period. Bob Dyer bought Halvorsen boats as he helped pioneer big-game fishing in Australia. Sailing was a significant passion for Carl. He spent many years crewing, but in 1967 he acquired his own yacht to helm. The choice, a 5.5-metre class yacht, is a reflection of Carl and his appreciation of boat design and construction. This class was a pocket version of the big America’s Cup International class 12-Metre boats – classic yachts, almost delicate but with elegant lines, precision design and a craftsman’s construction in wood, and demanding concentration and skill with their close sailing. The result was the stunning, dark-bottle-green Crest, built of Honduras mahogany at the Halvorsen yard. It was a design by American Bill Luders, the best designer in the class, but there was also a possible family connection, as Carl’s father, Lars, is thought to have worked in the Luders’ family yard while in America early in his career. Crest charted the first part of Carl’s decades-long passage in the 5.5s, winning numerous races and trophies, and creating friendships with rivals and colleagues throughout. In 1970 Carl generously lent Crest to Crown Prince Harald of Norway for the World Championships and watched the series instead of sailing in it. In 1973 Carl replaced Crest with the newly built Skagerak, also a Luders design, and once again lent his boat to Crown Prince Harald for the Worlds and Scandinavian Gold Cup, held in Sydney in January 1974. Carl and Skagerak were Australian champions in 1982 and 1991, came sixth in the Worlds in 1980 in Sydney, and won the first heat of the 1986 Worlds held off Palm Beach. In the Royal Prince Alfred 2001/2002 Division 1 series, Carl – then aged 89 – won first place in Skagerak. This was a partnership lasting nearly 30 years, but Carl’s other enduring partnership was family – the Halvorsens he had grown up with, and then his lovely wife Glenagh and their only daughter Verity, and with them his life was complete. Our thoughts are with the Halvorsen family as we farewell a good friend and remarkable sailor.